Zone Base: Hooray for Specific Jim! When Pacific Rim came in 2013, I was enraptured. It was this wonderful movie that captured and paid homage to the various super robot cartoons and kaiju movies I grew up watching. It was effectively a live action Saturday morning carton and I loved it. It quickly rose to replace Halloween (1978) as my number 1 favorite movie (don't worry, Halloween is still pretty high on the list). Following seeing it, I'd approach people and talk to them about the movie like it was a new religion I had found and wanted to spread. It was just so wonderful I couldn't stop gushing over it. So of course, I've been following the on again/off again news of the sequel. For a while they were calling it Maelstrom, which would have been a damn fine name. However, it's ultimately been named Uprising, which is a great fitting name for a follow up. Maelstrom implied an onslaught of kaiju and just a pure storm of hell on earth. 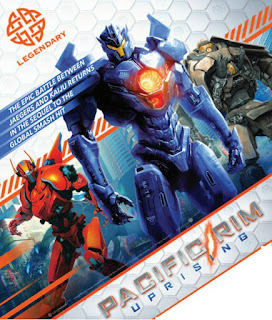 Uprising is an more ominous title. It can imply both bad and good themes. 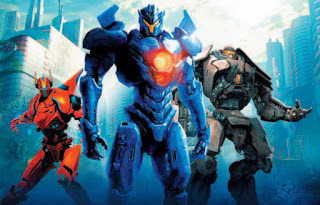 The Kaiju have returned, but so have the Jaegers! When the art first popped up, everyone was quick to figure out the new form of Gypsy Danger. The other two were a mystery. Lots of folks speculated they were new versions of Crimson Typhoon and Cherno Alpha, others (like myself) thought they were new Jaegers. Just a day later the Pacific Rim Facebook page confirmed they were version 2.0 Crimson Typhoon and Cherno Alpha (after I had already recorded my podcast episode for the week speculating they were new bots *sigh*). Making things more exciting, that's not just Gypsy Danger 2.0, it's now named Gypsy Avenger! Which is just an awesome name and really fitting for a new version. I'm bubbling over with excitement and not being very patient waiting for this new movie to come out. I literally cannot wait, and ... you know that particular feeling of excitement you get as a fan? That mix of euphoria, excitement, and bewilderment into a feeling of joy that's next to impossible to express? Well right now I could bottle it in bulk and sell it. I see this and want a game by Konami for my Super Nintendo.